BrandOS – Applies custom operating system branding. Branding must be pre-configured and saved prior to running in Auto Mode. Install Custom Shortcut – Installs a custom desktop shortcut to a web address of your choice (either a URL or LNK file) which you can configured in Config > Custom Stuff. Install Custom DNS – Install custom DNS servers specified in the Pri/Sec boxes below. 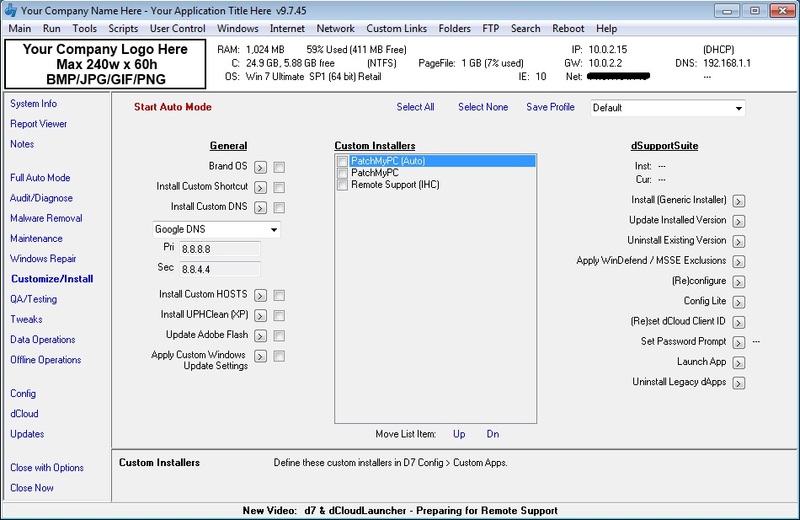 Use the drop down list to select one of several pre-configured servers. Use the Save Config link at the top of this page to save these servers for future usage and in Auto Mode. Install UPHClean (XP) – Installs the User Profile Hive Cleanup Service on Windows XP. Update Adobe Flash – Updates all Adobe flash plugins found for all browsers. dSupportSuite – For the dSupportSuite Foolish IT application which you may or may not use.